I have always been a very meticulous planner. 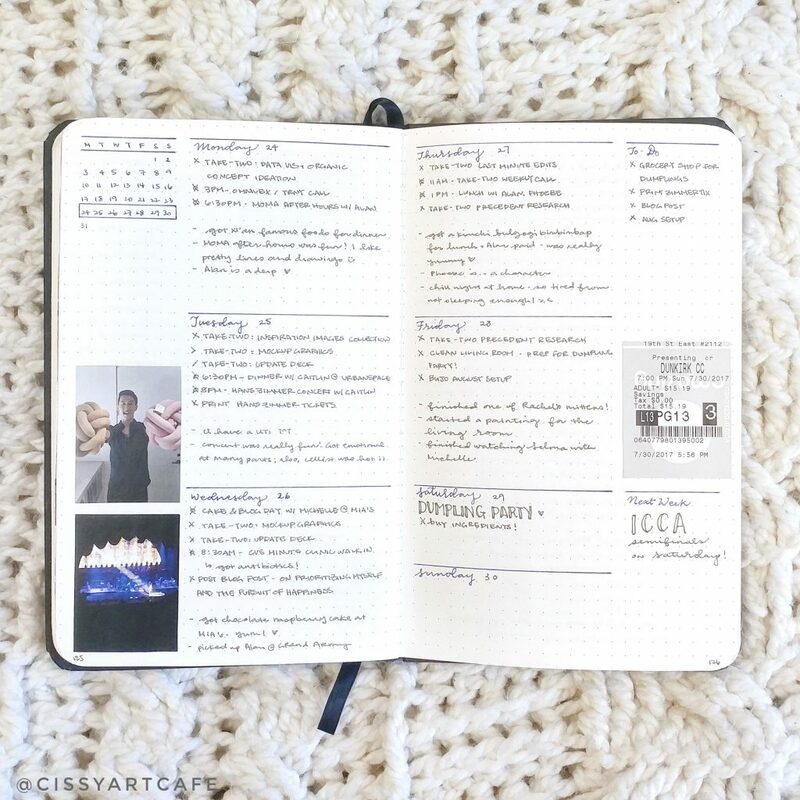 My neuroticism and perfectionism in my projects lend themselves well to creating a robust planning system, and ever since I got my first school-issued planner in 9th grade, I created a detailed timetable and assignment system that helped me keep track of all my work and figure out how I could fit my electives in with my homework. After high school, I switched to a digital system. My entire life was mapped out in my Google Calendar - and not just the college courses I was taking and the time allotted for my dance team rehearsals. I had tasks listed out in my Google Calendar as well, and when my days got more packed with work, I would schedule out every task in time chunks and even assign time to sleep. 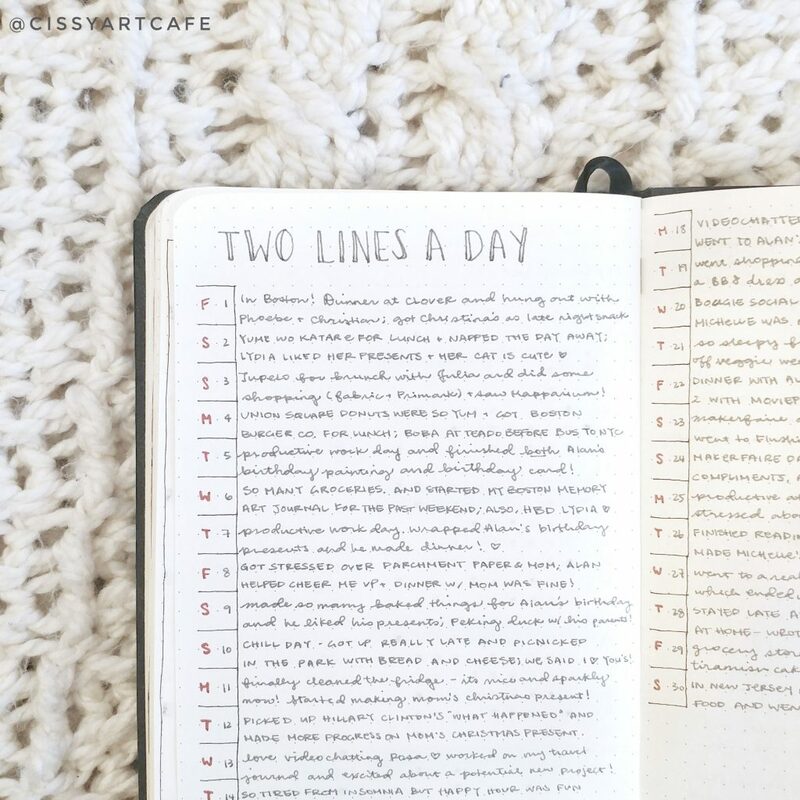 It was during college that I discovered the bullet journaling system. I don't remember exactly when, but I was most likely mindlessly scrolling through Pinterest and/or Tumblr when it came on my radar. I tested out the system in an abandoned sketchbook, and pretty soon after that, I was hooked. 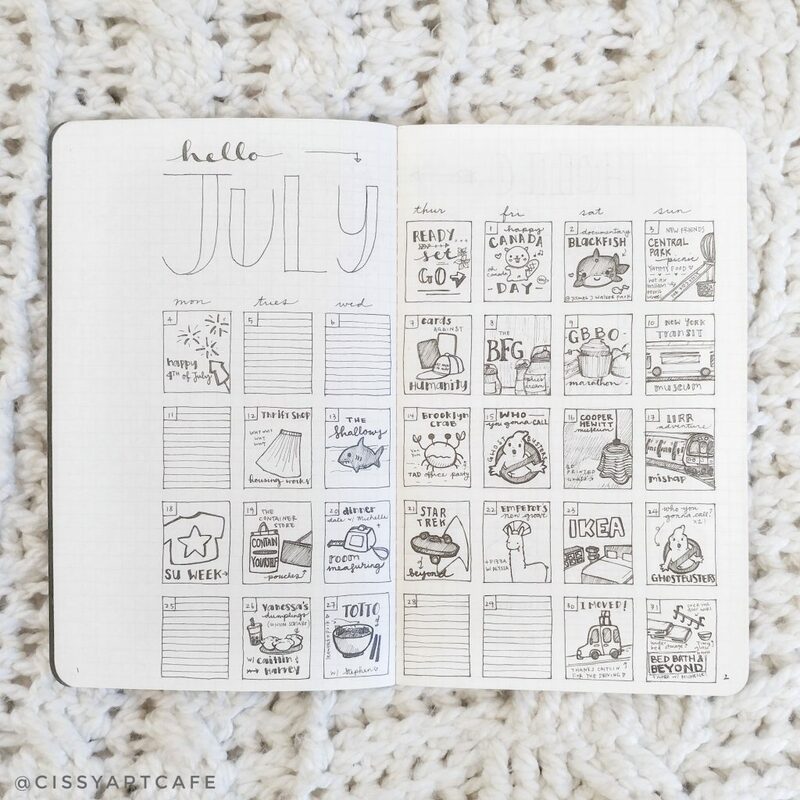 Right before I moved to New York in June of 2016, I treated myself to a Webster's Pages fauxdori and decided to build my bullet journal within it. 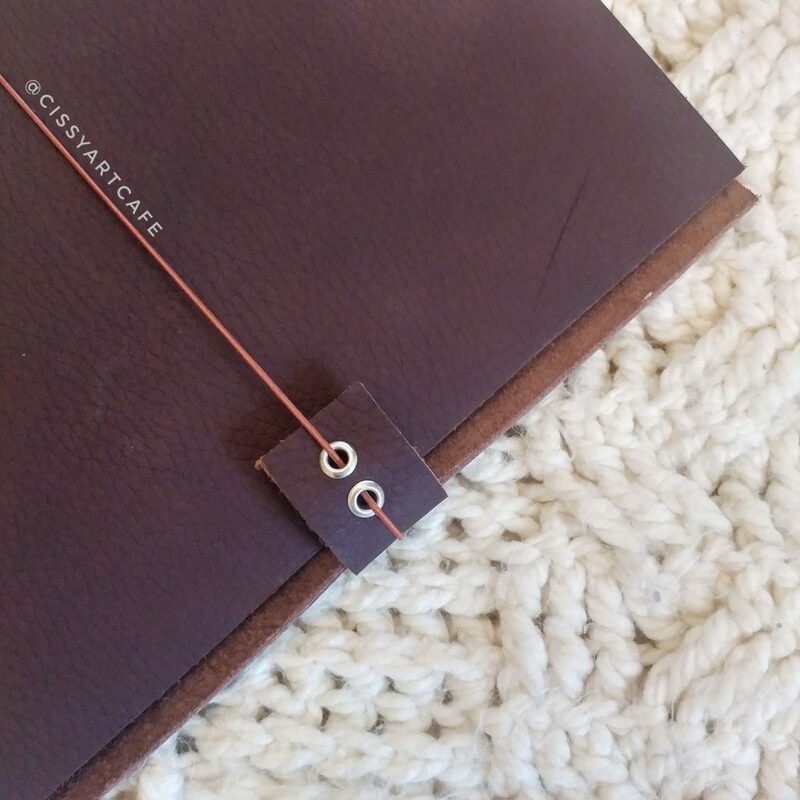 I think if you've ever used a traveler's notebook, you'll understand the appeal! I liked that I could keep everything together but still in separate categories. 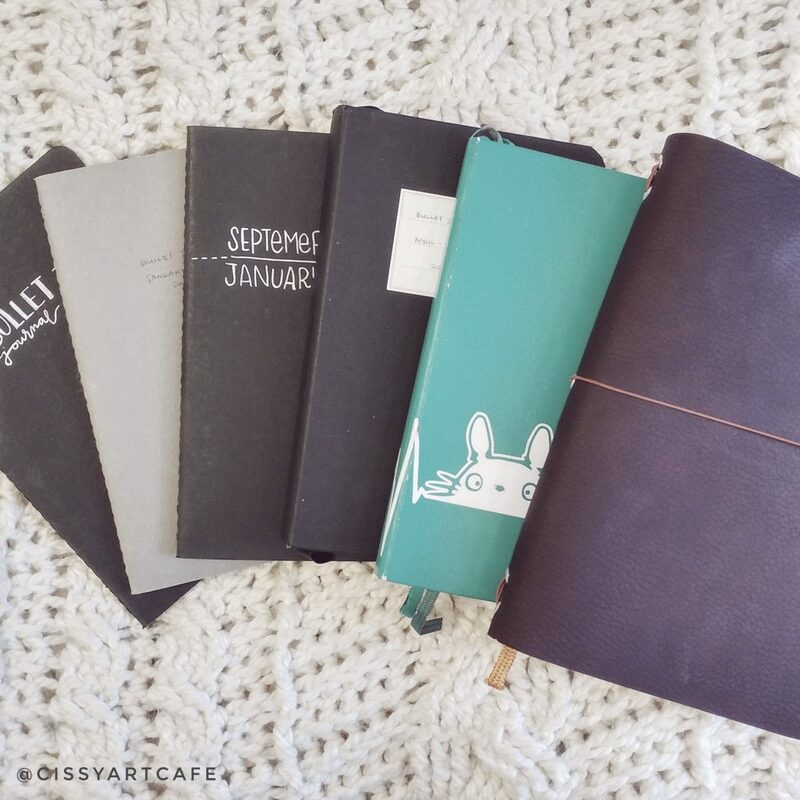 Within mine, I kept 3 Moleskine cahiers: 1 bullet journal, 1 long-form journal, and 1 sketchbook. One of my first spreads that I experimented with. I found that this layout didn't give me enough space for my tasks, and was a hassle to set up, although the uniformity of the boxes pleases me greatly. Within these, I was able to experiment with different layouts and test out what I liked and didn't liked. 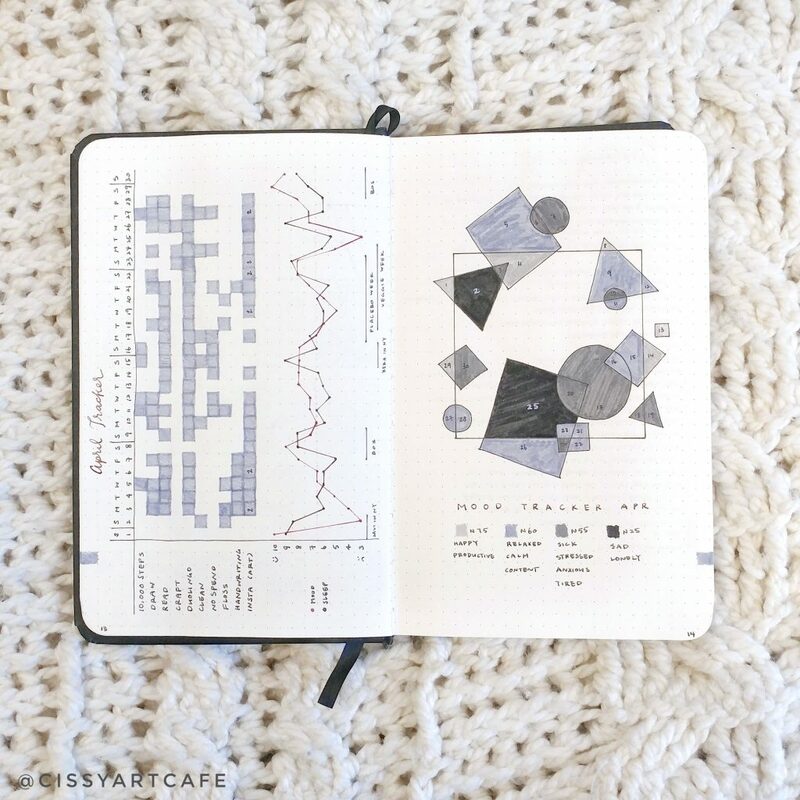 I discovered that I was able to rekindle my childhood love for journaling as I explored a new city, and that habit tracking really appealed my inner data visualization nerd. I couldn't really get into using an index page or any kind of future planning system, and I continued using my Google Calendar digitally. My first ever set of calendar memory doodles! This began a month after I moved to New York as a method to help me remember the things I did while I explored the city and made new friends. I came up with my calendar doodles during this time, and it is one of the only things that I have continued to be consistent with. However, as I continued using this system, I became dissatisfied with the paper quality of the Moleskine cahiers. While the first few were okay, I felt like there was a drastic change in how my pens reacted with the paper, and my later few cahiers seemed to be more prone to smudging. After rather extensive research - I am a research nut, after all, and I do not like wasting money - I settled on using a locally made Northbooks hardcover notebook that was just under an A5 size and could still fit in my Webster's Pages Traveler's Notebook. One of the first spreads in my Northbooks notebook. The mountain is from an album cover that I discovered and liked on Spotify, but wasn't intended to have any other meaning. I bought a bound sketchbook fairly soon after I bought my Northbooks notebook, so the Traveler's Notebook was abandoned rather quickly. Within my new bullet journal, I learned to index a little better, although I still don't prefer it as a method; I find it tedious even though it's an integral part of the system. The first mood tracker I ever tested. I still really love this spread, and I plan on turning it into a printable sometime! I really like that these trackers can be used for moods but also for tracking any other month-long activity. 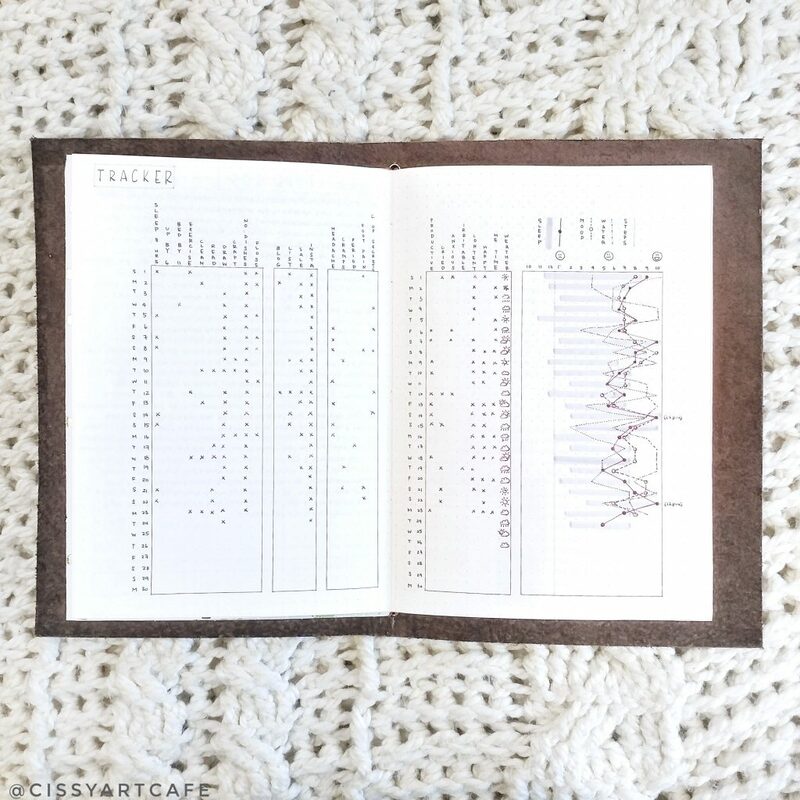 While I was still experimenting with layouts, I also began playing with more elaborate habit trackers and incorporating more artwork into my bullet journal through mood trackers. Some of these mood trackers actually ended up becoming pretty popular on my Instagram, a phenomenon I have yet to figure out how to recreate! I assume it just got picked up and shared by someone with a larger following, but I still have no idea how that happened. 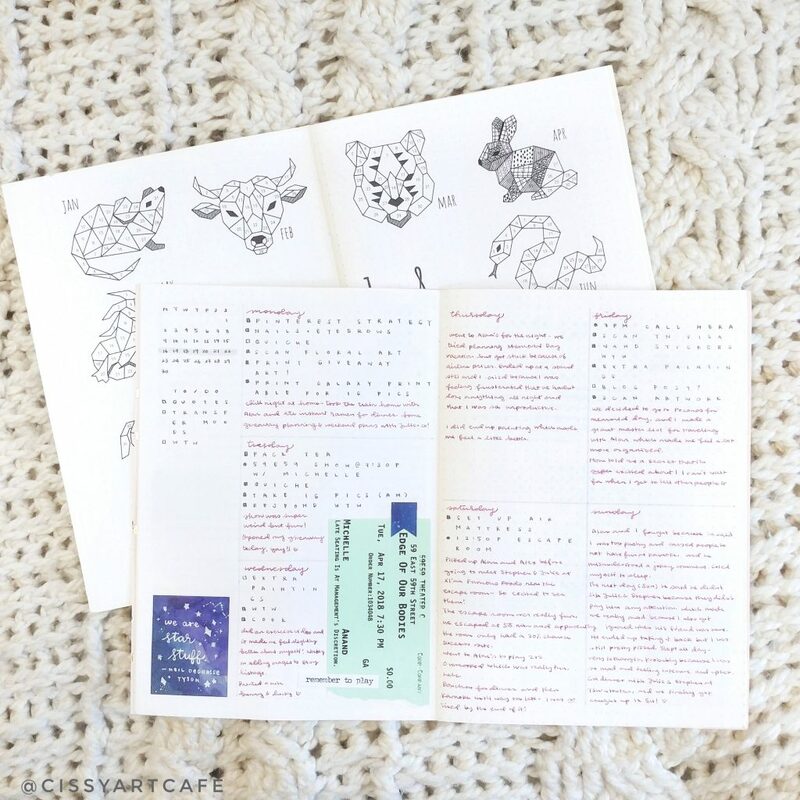 While this particular one isn't available yet in my Etsy, you can find a fun art splatter tracker and a geometric animals mood tracker to print for yourself there. Now that I had consolidated my cahiers into a single notebook and was no longer using a separate-but-together method, I wanted to figure out a better way of incorporating my long-form journaling with my weekly spreads. I attempted to use dailies for a while, but they became annoying to set-up; I also tested out various weekly layouts in an attempt to see what gave me the most extra space. I tried using Some Lines A Day spreads, which I liked but left my weeklies too empty for my liking. I ended up journaling my weeks within my weekly spreads and giving myself extra space to journal the weekends on separate spreads, which is what I've generally stuck to, although I've become more concise in my journaling and therefore need less extra space nowadays. I also art journal a little bit more, which means long-form journaling has taken a little bit of a backseat. As my Northbooks notebook got filled, I began researching the next notebook to purchase - and ended up selecting the cult favorite Leuchtturm1917. This notebook was all about experimenting with different types of trackers and different layouts ( obviously, a common trend in my bullet journals). As a fairly artistic person, I attempted to do some more artistic spreads - but I found rather quickly that they were overwhelming and not functional for me. There was a month where I tested a different weekly spread every week, and about a month and a half later, I eventually found one that I think works best for my needs. The Leuchtturm is also when I first introduced my overly extensive trackers that I still use today. I wanted to see how my sleep and moods correlated with my evaluated mental and physical health, and since I already had quite a few months of habit tracking under my belt, I knew that the personal data was an effective tool to managing and evaluating my own happiness. My favorite tracker trend that I've noticed is how much my moods picked up after my ex and I broke up; my most practical is probably the rather obvious correlation I've found between my sleep habits and my headaches. I also discovered that I really prefer being minimalist with my bullet journal spreads. 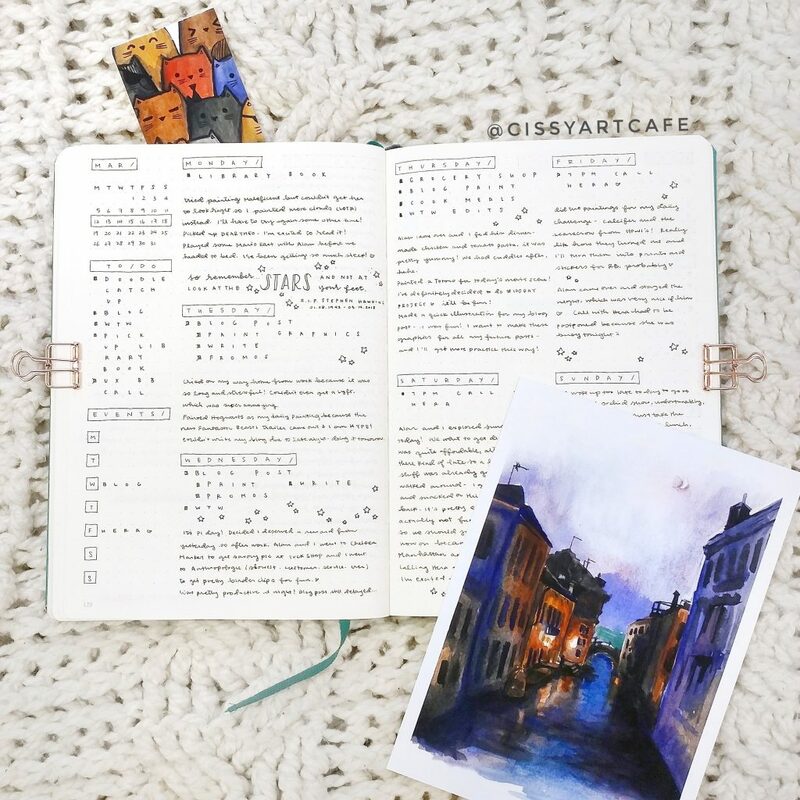 As I've mentioned before, I like to work on many projects at once - and making my bullet journal elaborately beautiful was a project I found that I did not want to take on and quickly became overwhelming. I ended up stripping down all of my spreads into their most minimalist states, and I've kept it that way since. You can find my Venice art print and my cat bookmark in my Etsy shop. The Traveler's Notebook bug bit me yet again after I watched My Life In A Bullet's DIY Traveler's Notebook video, and I ended up moving on from my Leuchtturm earlier than I had originally planned. And so, we arrive at my current set-up. I'm using a traveler's notebook with inserts that I made myself. I've realized that this method gives me the best opportunity to appease my inner paper critic, helps me avoid dealing with any tedious indexing, and allows me to have an ideal separate-but-combined method of organizing again. Within this notebook, I have 1 insert that is meant to be kept for the entire year, including my year in pixels mood tracker, my calendar doodles, and plenty of space for collections; I have another insert for my monthly, gratitude logs, goal setting, and weeklies that I'll need, which I'll swap out whenever I run out of space; finally, I have my sketchbook inserted in the back which I plan to replace with plenty of loose-leaf drawing and mixed media paper that I can then bind together later on. I keep decorating to a minimum, with some photos printed out, some memorabilia stuck in, and some printable stickers to add a little bit of charm. I envision being able to bind all my inserts together at the end of the year, resulting in a year-long snapshot of my life. I hope to continue this method on for a long time, and that I'll have a bunch of DIY books to look back on in the future. Habit tracking: a constant exercise in figuring out how many layers of data I can fit on two pages. 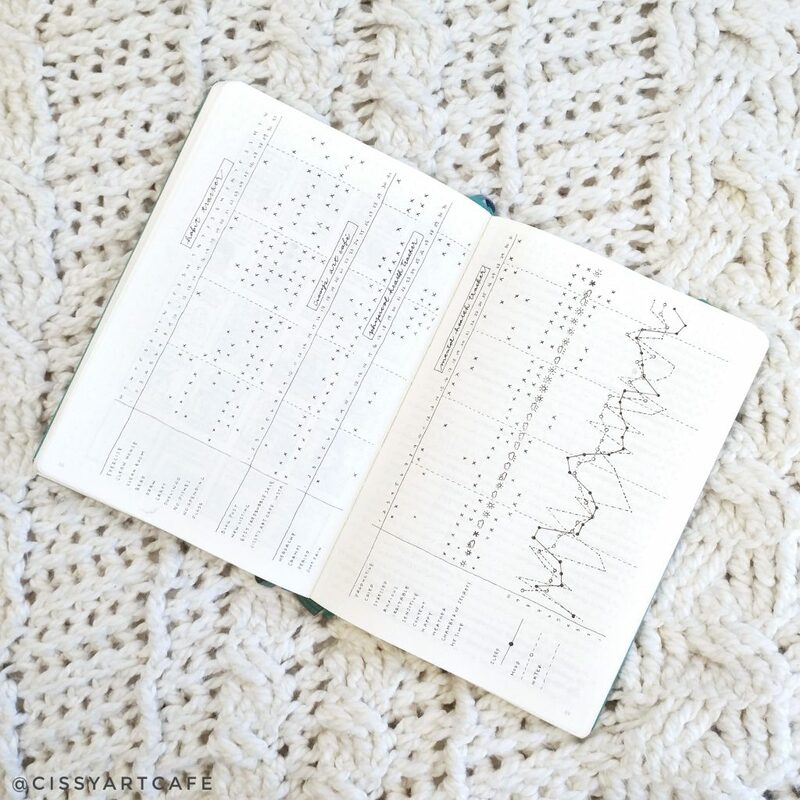 I've also managed to discover my perfect habit tracking method and my perfect weeklies - with journaling incorporated, of course - and they're just simple enough to maintain regularly. 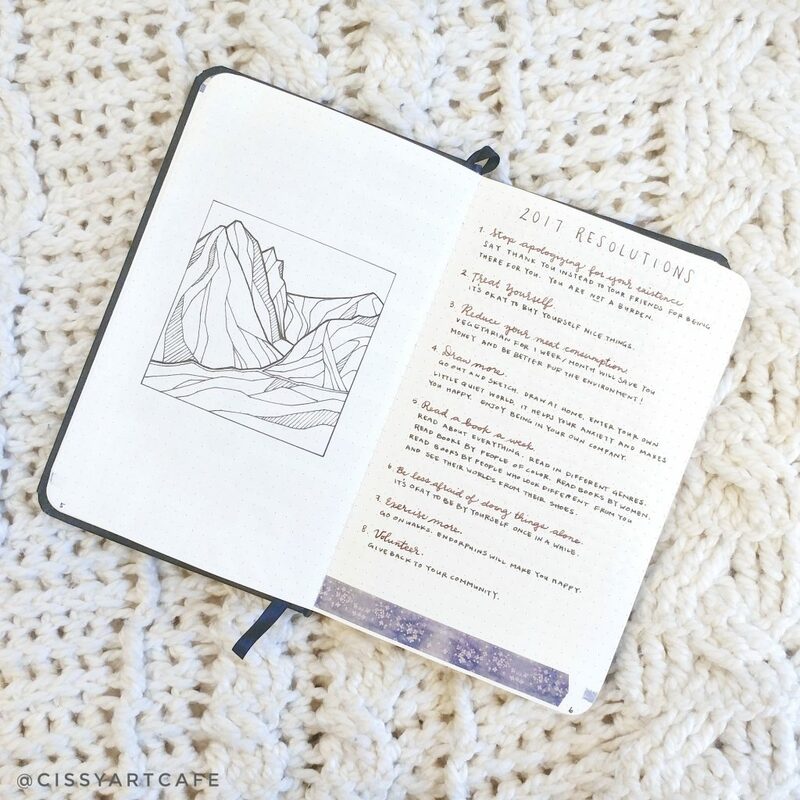 While Pinterest and Instagram are full of elaborately beautiful bullet journals, the main point of a bullet journal is for it to be functional for you. If it's not, switch it up! I've obviously switched mine up a lot over the past few years of using this planning method, and I love that the system's flexibility allows me to do so. While it took quite a lot of experimentation, I'm happy to have found something that I think really works for me! 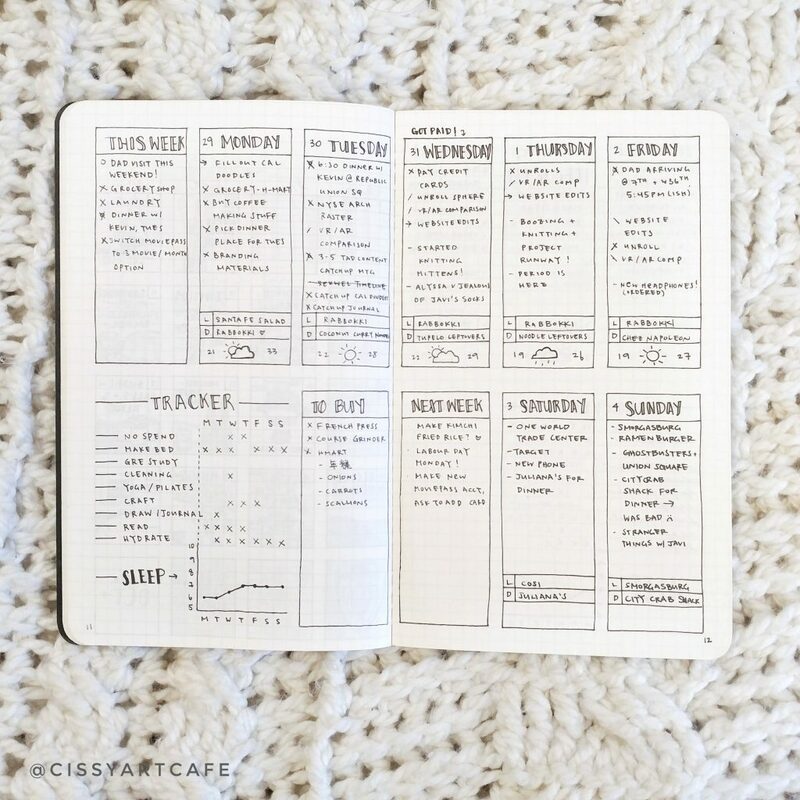 Everyone's method of planning and bullet journaling is different, and I've tried nearly everything to find what lets my heart sing. 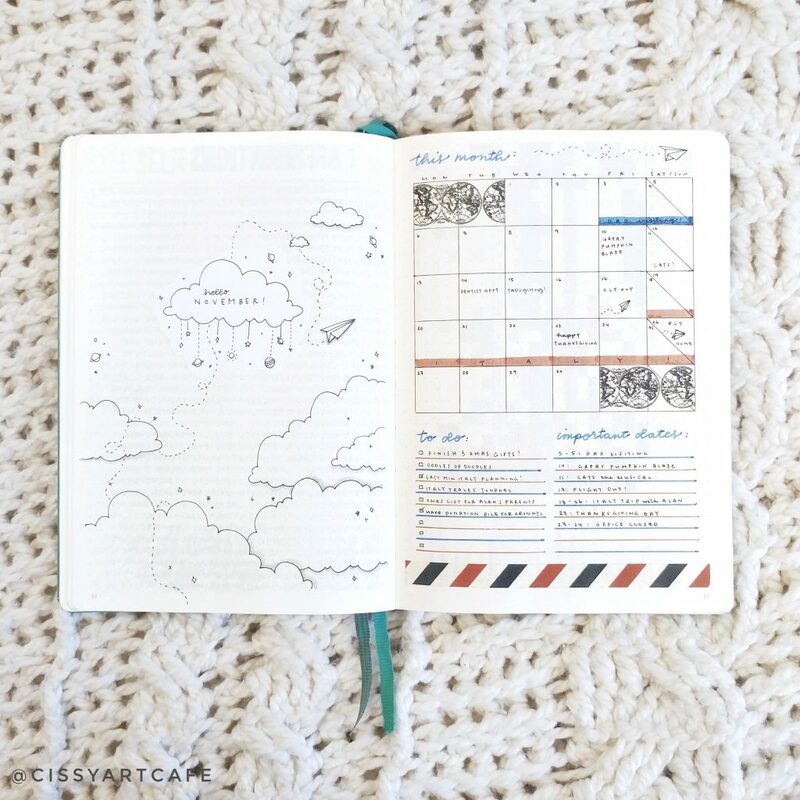 I hope that some of this was helpful for you, and some of my spreads might serve as inspiration for your own planning journey! What works best for you in your planning system? I'd love to know!